The charge against the activists — most of them foreign nationals from Britain, Argentina, Finland and other countries — dimmed hopes that 16 others detained over the protest could be indicted on a lesser charge. Piracy by an organised group carries a punishment of between 10 and 15 years. A spokeswoman for the Investigative Committee declined to provide details, saying only that the activists from the group’s Arctic Sunrise icebreaker, placed in pre-trial detention for two months, were being charged. The rest of the activists are expected to be charged Thursday. “This is an outrage and represents nothing less than an assault on the very principle of peaceful protest,” Greenpeace International executive director Kumi Naidoo said. He said the charges represented the “most serious threat” to environmental activism since the group’s ship Rainbow Warrior was bombed by French special services in New Zealand in 1985. The charges of piracy came despite President Vladimir Putin’s last week statement that the activists “of course are not pirates.” He however said that they had broken the law by protesting close to an oil rig. Putin’s spokesman Dmitry Peskov told AFP on Wednesday that Putin had expressed his personal opinion. Among those already charged were a British freelance videographer and a Finnish activist, who was one of the climbers who attempted to scale a Russian oil platform. Greenpeace says it will appeal and turn to the European Court of Human Rights. Russian investigators opened a probe into piracy after several of the activists tried to scale state giant Gazprom’s Prirazlomnaya oil platform in the Barents Sea last month. The group has denied the charges and accused Russia of illegally boarding its ship in international waters. The 30 activists from 18 countries are being held in detention centres in the cities of Murmansk and Apatity, which are nearly 2,000 kilometres (1,250 miles) north of Moscow and above the Arctic Circle. The crew members are “close to shock” over their conditions in their jails, an activist said. They have complained of cold, smoke-filled cells, and a lack of suitable clothing and food, Irina Paikacheva, the head of a state-linked prisoners’ rights watchdog, told AFP. 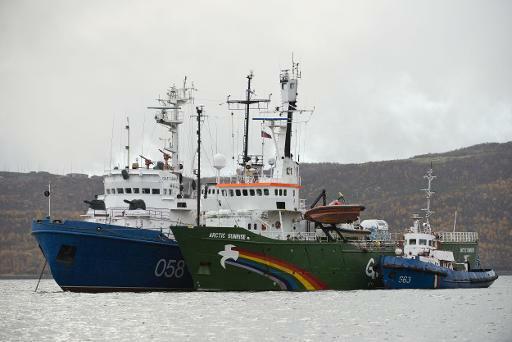 The Netherlands, the icebreaker’s flag country, last month urged Moscow to release the activists and said it was considering legal action. Maritime expert Mikhail Voitenko said that the activists might have deserved hooliganism charges, but that the piracy accusations were likely to damage Russia. “You have to be mentally deficient and inept to label their attempt to protest at the Prirazlomnaya ‘piracy,'” he wrote. Prime Minister Dmitry Medvedev said on Wednesday that the government may toughen up punishment for trespassing at energy infrastructure. Greenpeace held a similar protest at the same oil platform last year without incurring any punishment. The unusually tough charges are likely to generate new controversy as Russia gears up to host the Winter Olympics in February already overshadowed by claims of gay rights abuse. Since returning to the Kremlin for a third term as president last year, Putin has sought to reassert his control over the country after huge protests in the winter of 2011-12. Last month, Putin pledged to fiercely protect Russia from foreign influence, saying its sovereignty and independence were “red lines” that could not be crossed. On Saturday, state television broadcast a smear documentary claiming Greenpeace served US corporate interests and made huge profits staging protests against Russian industries.